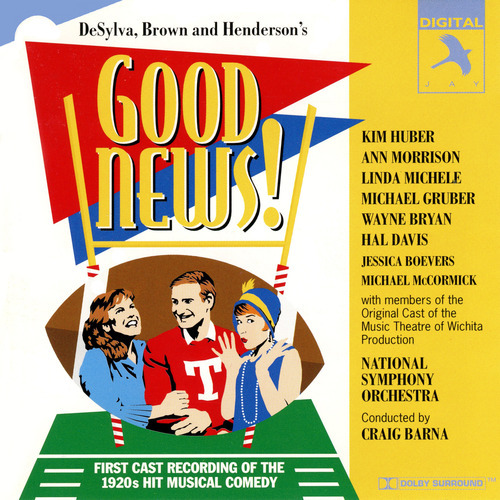 Jorge's Place: CD OF THE WEEK: GOOD NEWS! CD OF THE WEEK: GOOD NEWS! I think some of us believe there is an age that is more suitable for our tastes than the one we are actually living. For me it’s the 20s. I love the art deco sets, the elegant wardrobe, the glamour, the crazy parties and the music. So, it comes as no surprise, that I love musicals set on the 20s. All this brings me to GOOD NEWS!, one of my all time favorite scores. With music and lyrics by B. G. DeSylva, Lew Brown and Ray Henderson, it’s a reminder of long forgotten times when the aim of a musical was simply to entertain. The show opened in 1927 and return to Broadway in 1974, in a different production that took the action to the 30s. Between those two productions, it got the MGM treatment and became a successful movie in the 40s. In 1993, at The Music Theatre of Whichita, a new revised production returned to the 20s and interpolated other songs by the three-team composer. Fortunately, John Yap recorded it, giving us this exceedingly enjoyable cast recording. There aren’t big famous names in the cast, but everyone sounds like they were born on the 20s and they make us want to go back in time and have as much fun as they had in those times. I believe that most of the cast was older than their characters, but I don’t care; they sound like the real thing. Among the cast members there’s Ann Morrison (“Merrily We Roll Along”) who as Babe, a “vivacious flapper”, leads the company in the contagious “Varsity Drag” and simply delights with her duets with Wayne Bryan, “Button Up Your Overcoat” and “Never Swat a Fly”. Kim Huber and Michael Gruber are the romantic couple that delivers the lovely “The Best Things in Life Are Free” and alone, Huber sings the beautiful “Just Imagine”. Michael McCormick has a good time as the football trainer and cheers us all with “Keep Your Sunny Side Up”. As the astronomy teacher, Linda Michele teaches her young pupils “Life is Just a Bowl of Cherries” and I like to agree with her. Everybody do the varsity drag!”. You won’t regret it! Sandy Duncan does "The Varsity Drag"
I don't know this recording (and I thought I had everything)! I must try to find a copy online. I did see the 70's revival with Alice Faye, John Payne and Stubby Kaye when it came to Toronto as part of a very long pre-Broadway tour. I loved it! I was just a teenager, but I remember so many of the songs, dances, sets, costumes and performances very clearly. It was a hugely enjoyable show with nothing else on its mind but providing great entertainment. I was very fortunate, years later, to find a copy of a privately issued, limited edition, two record set of this show's original cast album in a shop in London, England. I don't believe that it was ever released commercially. I have been listening to it for years and I still listen to it today. It always brings back memories of a wonderfully joyous production from my youth. You should try to find a copy of this recording, is highly entertaining and the cast is terrific.